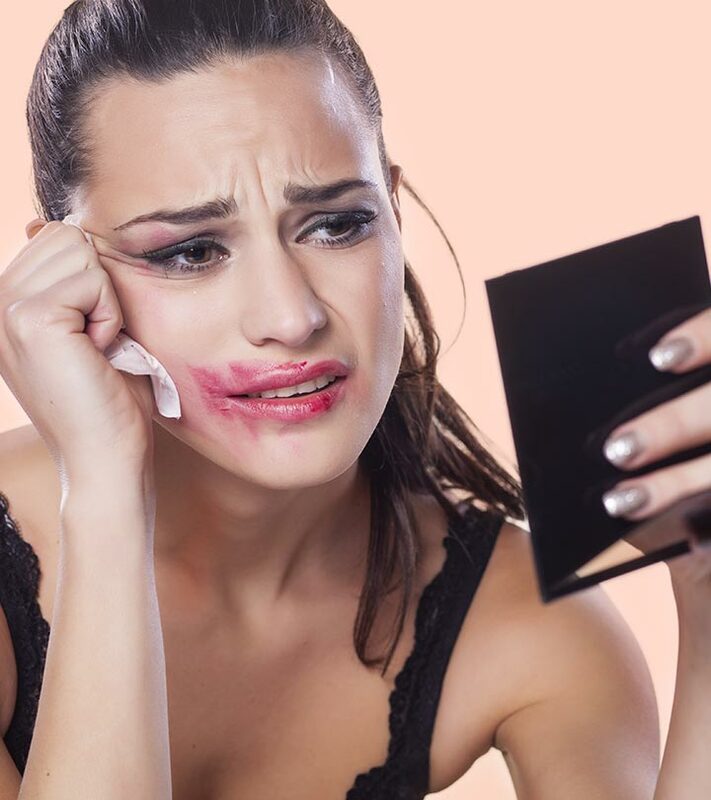 Lipstick Bleeding: How To Keep Lipstick From Smudging? Every now and then, we are caught gaping at beautiful women on the telly, almost drooling at their perfectly done makeup. Those attractive eyes, the chiselled cheeks, and those rose-red lips! How do they even keep that bright and vibrant lipstick in place? And how often have we fretted over our lipstick color fading away even before the party was over? Here’s a very easy tutorial that will help you achieve that long-lasting, smudge-free lipstick. Trust me, it is no rocket science! How To Stop Lipstick Bleeding? Always begin with prepping your lips by applying a lip balm/lip conditioner. This will make your lips soft and supple, and the application becomes effortless thereafter. Next, apply a foundation/concealer on the lips, and set it with compact to create a flawless makeup base. 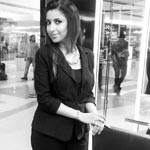 This technique also helps to keep the lipstick intact. Start lining the lips with a lip pencil. Once you have outlined the lips, fill the entire lip area with the same lip pencil. Now, swipe the lipstick over your lips. 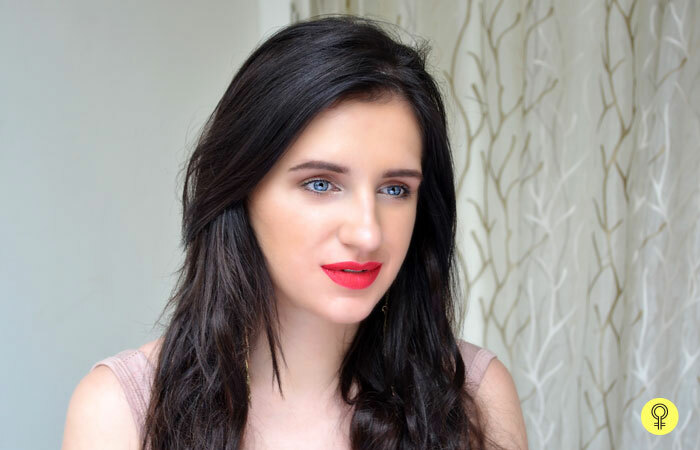 In this tutorial, I have used a gorgeous bright red lipstick in matte finish. Dab some loose powder on the lips with a small fluffy brush after applying lipstick, as shown in the picture. Let it rest for 5 to 10 seconds. I have used a transparent finishing powder here. Now, take a small flat brush and slowly sweep the powder all over the lips, till you get the desired matte finish, and then blend. This technique helps in sealing the color on the lips and prevents smudging as well. Once you are done with Step 3, take a clean tissue paper and fold it into half. Place the tissue between your upper and lower lips. Blot the excess lipstick with the tissue as shown in the image. Don’t worry about this technique making your lipstick appear uneven or faded. You can fix it later by reapplying it. If you are a lip gloss fan, then swipe a coat of lip gloss just on the center of the lips. This will prevent the bleeding of the color around the lip area. The easiest way to prevent smudging of lipstick is by applying a lip primer. It works as a base for the lips, holds the color for a longer time, and also prevents bleeding of the color. In case of any unevenness around the lip or jaw area, correct it by using a concealer or a foundation shade that is close to your skin tone. A lip pencil/liner is a great choice of base to prevent smudging. Choose a lip pencil that exactly matches the lipstick shade. Outlining and filling your lips with a lip liner prior to the application of lipstick helps to increase the longevity of the lipstick, irrespective of the formula or quality. Always use a thin lip brush to apply the lipstick as it gives you an even application and helps you reach even the corners. Always carry a lip color in your bag for quick touch-ups. Wasn’t that easy? A little practice is all you need to keep your lipstick from fading. And you will never again have to buy a long-stay lipstick again. Say goodbye to frequent reapplication and say hello to forever gorgeous lips! 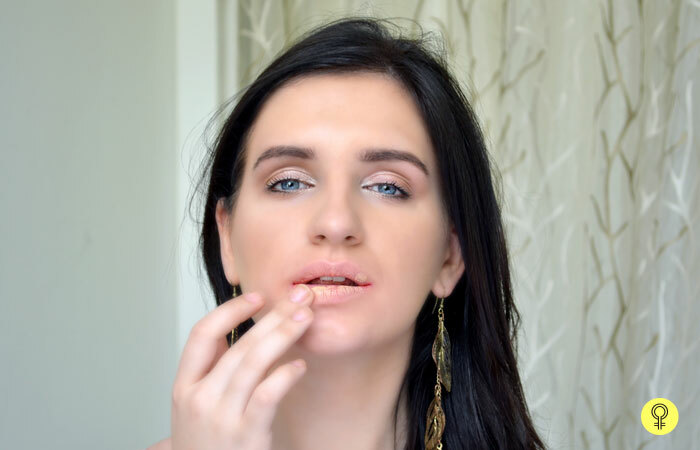 How To Prevent Lipstick From Getting On Your Teeth? 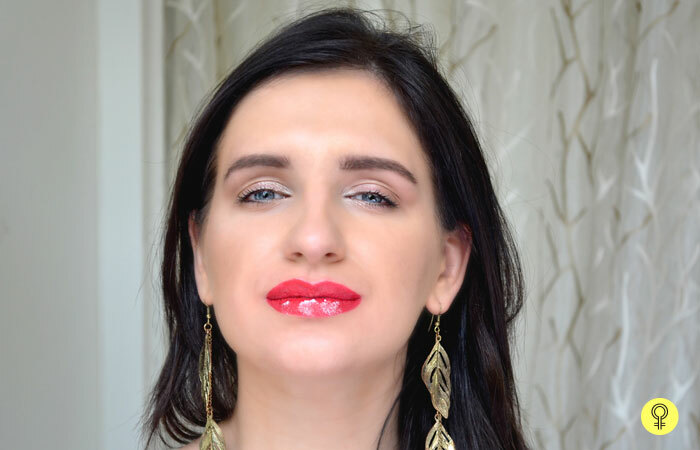 How To Apply Lipstick On Thin Lips Perfectly?